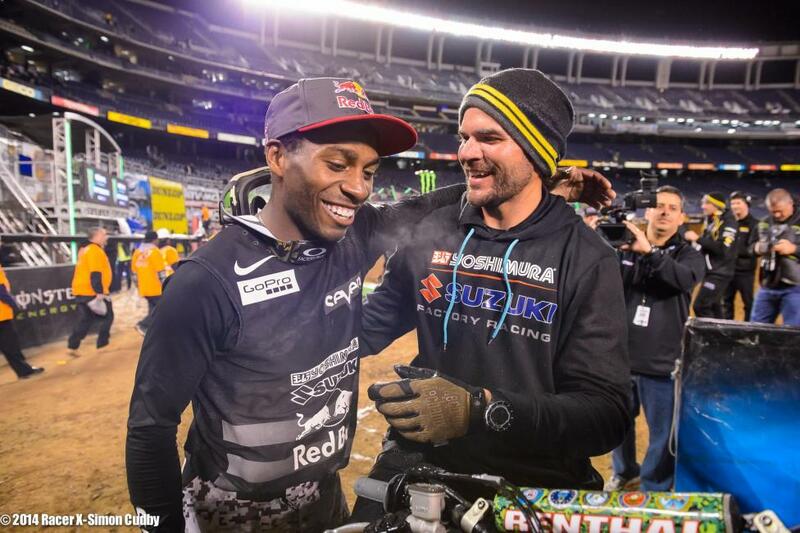 The California leg of the 2014 Monster Energy Supercross Championship concluded tonight in Qualcomm Stadium in San Diego, and while the night left some riders elated, it also left some racers staring at the shattered pieces of what was once a legitmate shot at a championship. Here's how it all went down. Andrew Short kicked off the 450SX main event by taking the holeshot, but was quickly passed by Ryan Villopoto and James Stewart. Justin Brayton was running well early but lost a ton of time when he went over a berm with his front wheel and got going again in near dead last. When it was over he'd managed to charge back up to ninth. Villopoto is dangerous, especially with a clear track but Stewart was determined not to let him get away with this one. 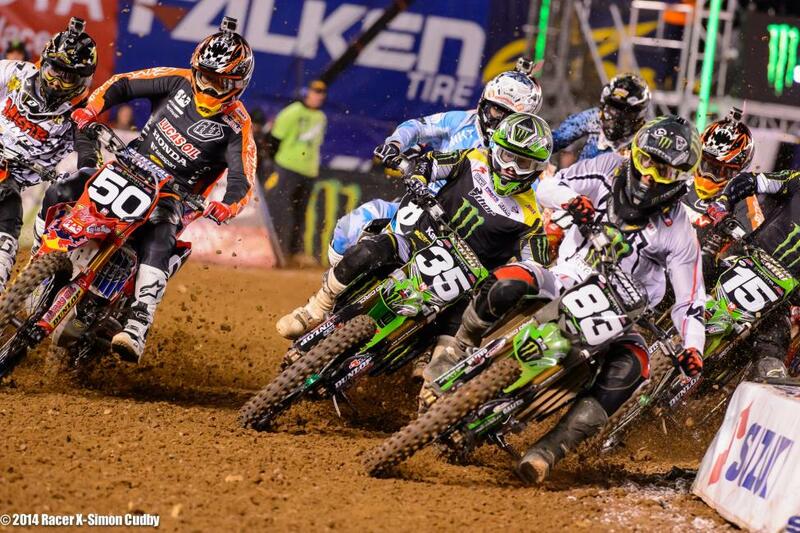 Stewart wasted no time in going after Villopoto and knifed underneath him in a 180-degree turn. 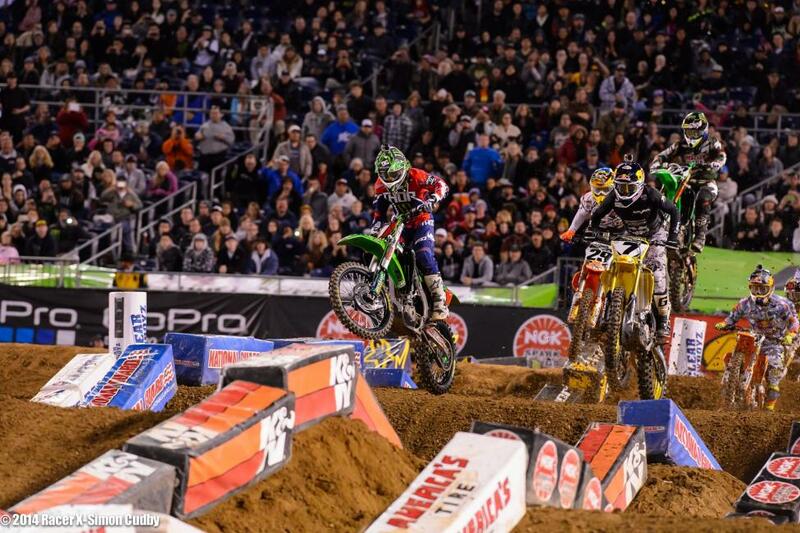 Villopoto immediately passed him back, but Stewart retaliated by scrubbing past Villopoto moments later. Stewart and Villopoto were this close for almost the entire race, but in the closing laps Stewart was able to start inching away, which was good for Stewart because he he lost some time near the end of the race due to lapped traffic. 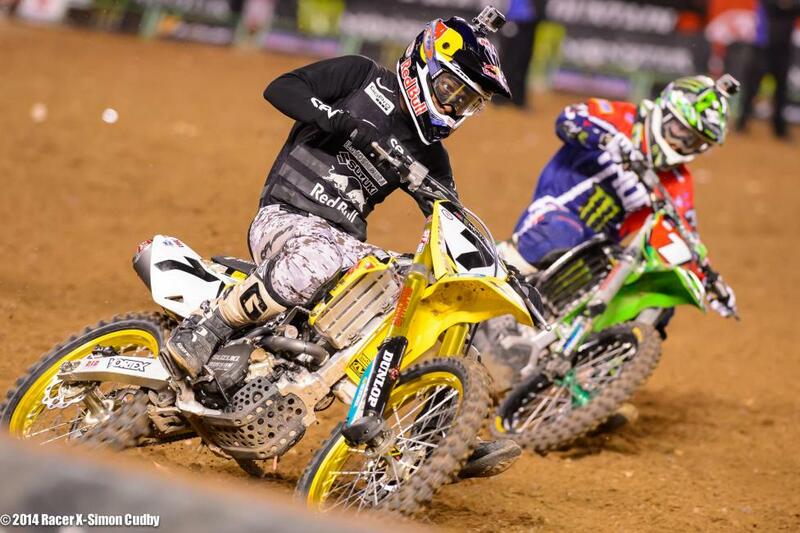 Stewart would hold on to take his first supercross win since last year in Atlanta. 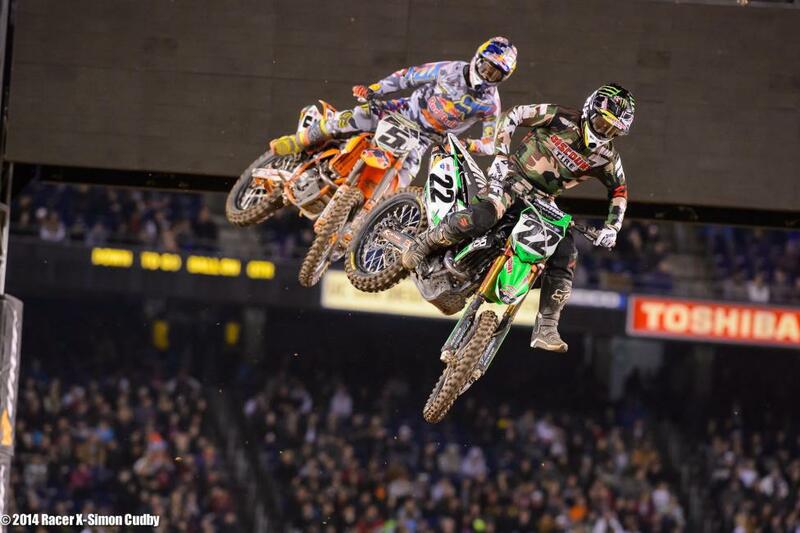 All eyes were on Chad Reed tonight, and for good reason. 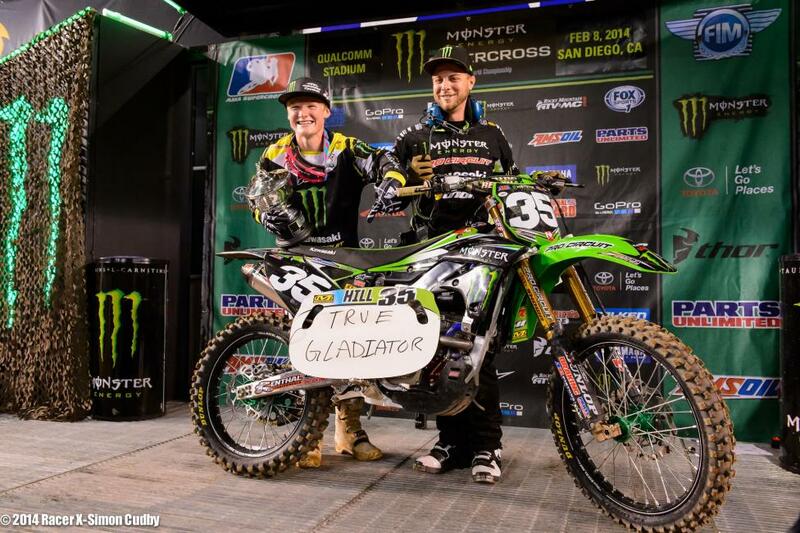 The veteran won last week at A3 and has a fantastic history of winning in San Diego. He started near the front but didn't seem to quite have the pace of the leaders. In the closing laps, Reed had caught Ken Roczen and along with Dungey, put on a great three-way battle for third place. Unfortunately it ended badly for Reed when he crashed hard on the last lap in the whoops. Reed was taken to the hospital and initial reports are that the injured his shoulder and was spitting up blood. Justin Barcia was quietly putting together a decent night and probably would have been a factor in the battle for third had he not crashed all by himself. 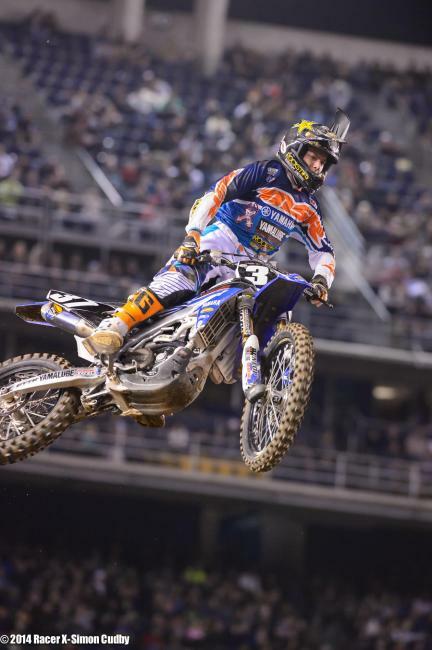 Also worthy of mention is Weston Peick's fantastic ride. 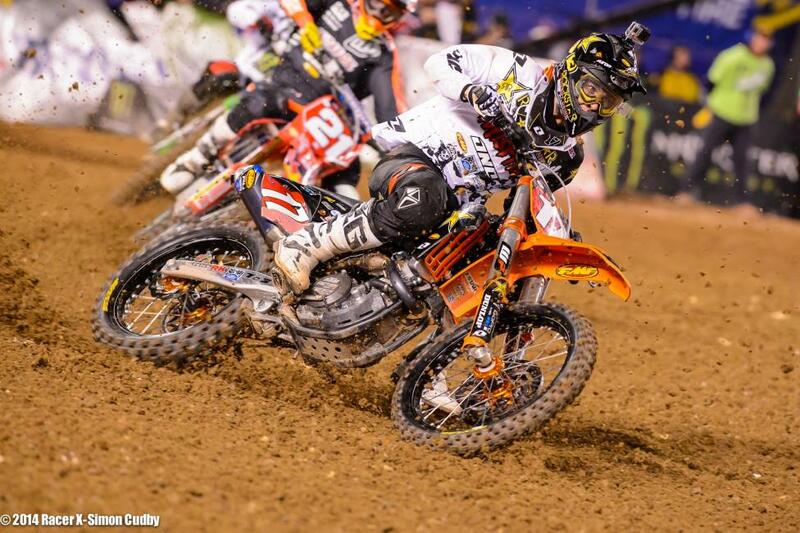 After rounding the first lap in fourteenth, the privateer hero fought his way up to an outstanding fifth place. 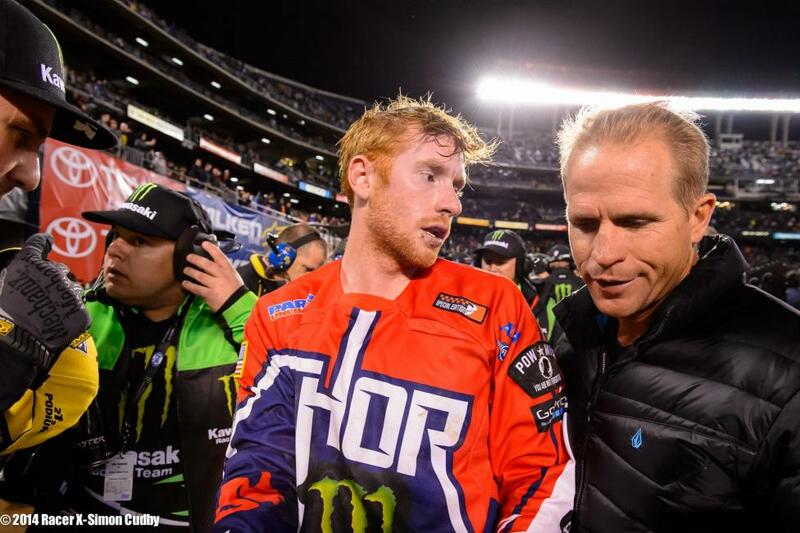 With his win Stewart moves into fourth in points, twenty-one back of Villopoto. Villopoto wasn't able to pick up a win in Southern California this year, but the good news for him is that he leaves the region with a nine-point lead over second-place Roczen. 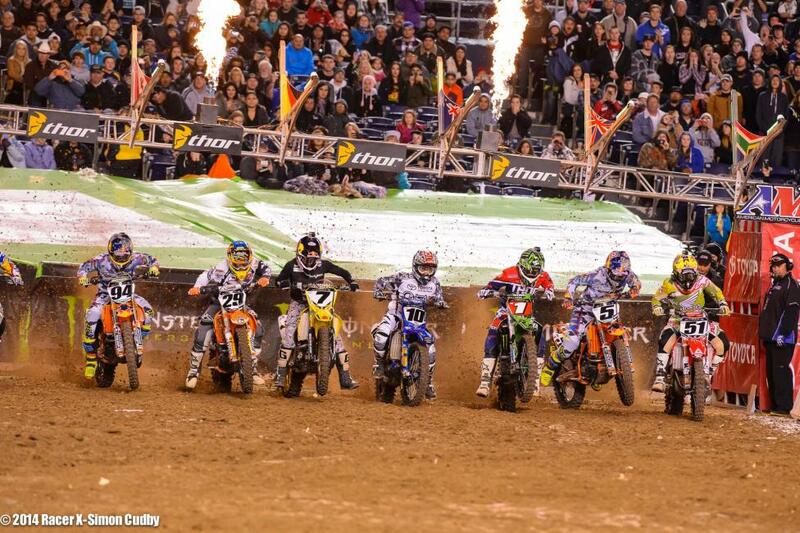 Dakota Tedder banged out a holeshot to get the action in the 250SX main event under way. Dean Wilson moved to the front almost immediately, and with Jason Anderson and Cole Seely running fifth and sixth, things were looking good for the Monster Energy Pro Circuit Kawasaki rider to go back-to-back. Unfortunately for Wilson, his chances at garnering consecutive wins would evaporate when he crashed and went over the bars. A lap later Wilson had to pull into the mechanic's area for repairs. He was able to rejoin the race but he was several laps down and finished twenty-first. Seely and Anderson were close in the beginning of the race, but Anderson was a tick faster than Seely, who was still recovering after a case of food poisoning confined him to his bed for two days earlier during the week. 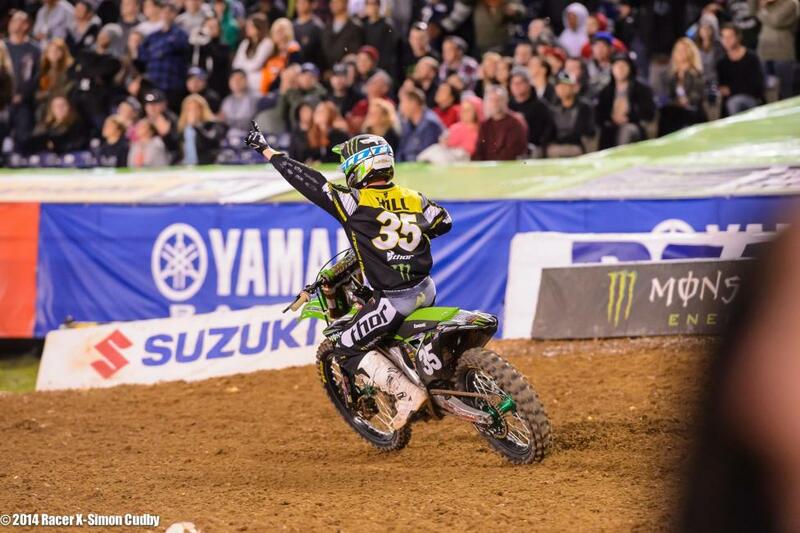 If Justin Hill can get good starts on a regular basis, expect him to be battling for wins and podiums when the Western Regional 250SX Championship resumes in Houston. Hill led fourteen of fifteen laps and looked great doing so. He kept his cool, didn't have any close calls and maintained his gap even when Anderson got into second place and really started charging. Hill notched the first win of his pro career tonight, but it didn't seem like he realized he'd taken the checkers at first. He kept charging for nearly a quarter of a lap before slowing down and celebrating. It might be the first time in the sport's history that lappers were held up by the winner of the race. Cooper Webb was never really a factor in this race. He didn't get a great start and went down in a rhtyhm section, losing a lot of spots in the process. He scored fourteenth on the night, and is starting to establish a pattern of having a good night one week and an off-night the next. The good news? He's due for a good night when the series resumes. Even though Anderson didn't win, he still has reason to smile. He goes into the break with a four-point lead over Cole Seely. 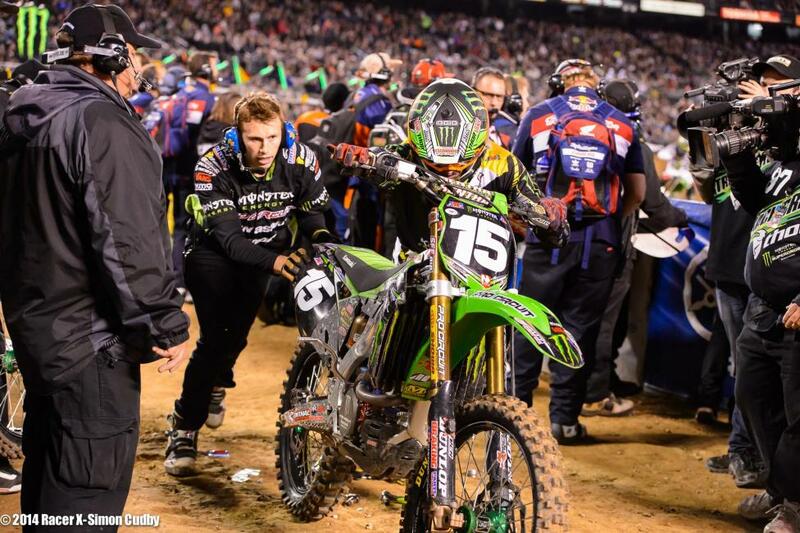 The racing has ended here at the season's final California round of Monster Energy Supercross. 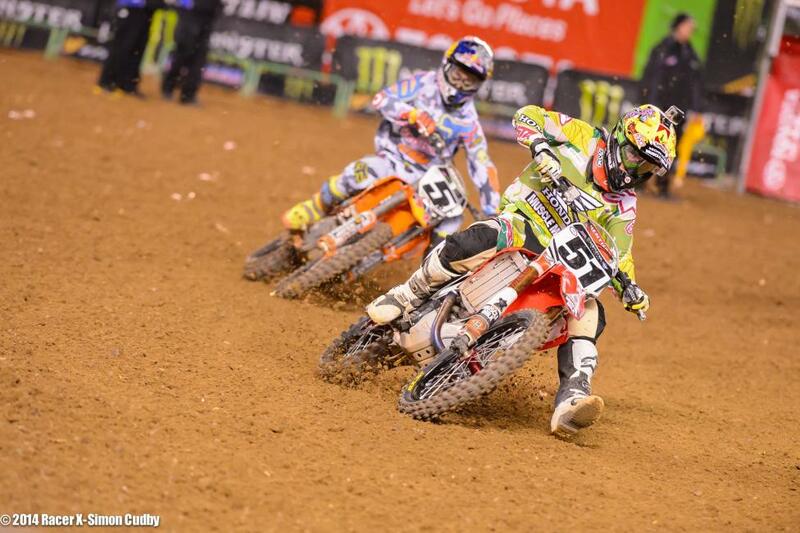 In 250SX action Dakota Tedder jumped out to the early lead but Dean Wilson quickly took it away. But then disaster struck for Wilson when he went over the bars in a rhythm section. He developed a mechanical problem and had to pull into the mechanic’s area to have it fixed. He came back out but was several laps down and finished in twenty-first. Justin Hill took over the lead with Jason Anderson and Cole Seely several spots back. Anderson worked up to second, but Hill was riding extremely well and held strong for the win. Seely looked to be a little off the pace and finished fourth behind Malcolm Stewart. Cooper Webb had a crash in a rhythm section and finished fourteenth. Anderson now goes into the break leading Cole Seely by four points. 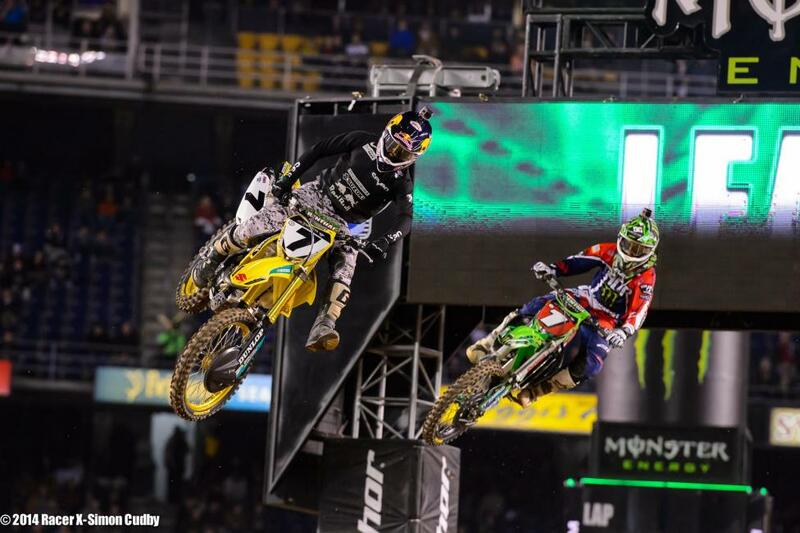 In the 450SX main Andrew Short took the holeshot but was quickly passed by Ryan Villopoto and James Stewart. 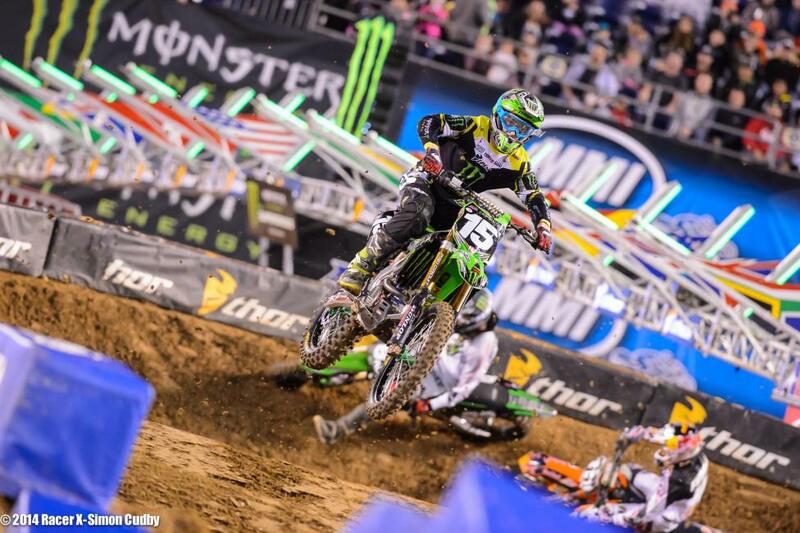 Stewart went to work quickly and knifed under Villopoto, only to be passed back almost right away. 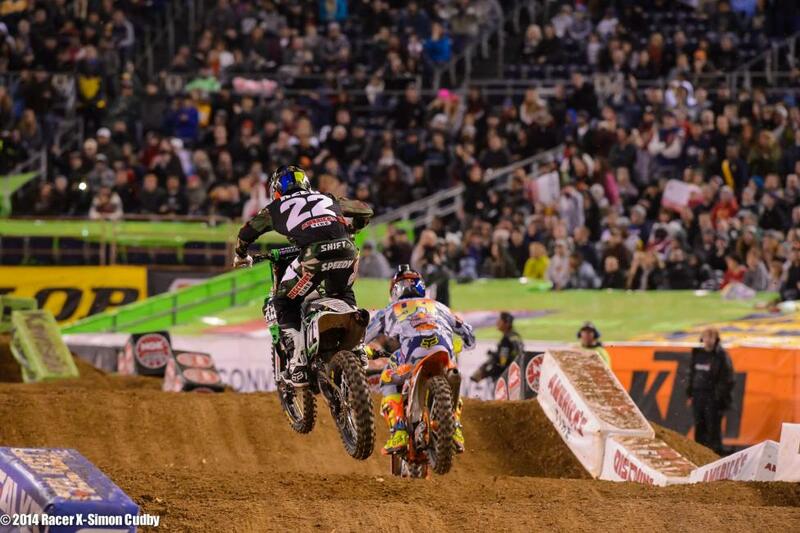 But then he scrubbed past Villopoto for the lead. 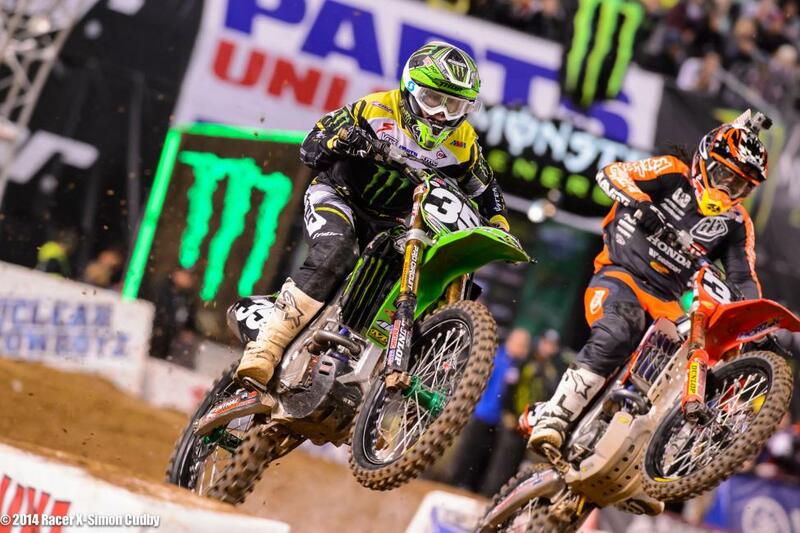 The two battled for most of the race, with Stewart inching away at the end for the win. Chad Reed held fourth for most of the race and was in a battle with Ken Roczen and Ryan Dungey for third but crashed hard in the whoops and might be injured. Villopoto took second, followed by Roczen, Dungey and Weston Peick.